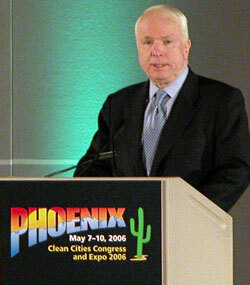 Senator McCain is speaking now and I’ll have his speech here for you in a little while. I’m going to try to get a personal interview with him on his way out too. He’s asking consumer to demand fuel efficient vehicles while he works on legislation to help in Washington. He just said he’s against government subsidies for ethanol. Now he’s talking about ethanol companies reporting record profits. He specifically mentioned ADM. He says distribution for ethanol is a big challenge and he hopes E85 becomes more available. Post Update: Here’s a couple of quick soundbites from Senator McCain which I was able to obtain as he was leaving.